Montreal City Hall on Notre-Dame, winter night. Édifice Ernest-Cormier, the Quebec Court of Appeal building on Notre-Dame in Old Montreal. Notre-Dame Street (officially in French: Rue Notre-Dame) is a historic east-west street located in Montreal, Quebec, Canada. It runs parallel to the Saint Lawrence River, from the eastern tip of the island to Lachine. One of the oldest streets in Montreal, Notre-Dame was created in 1672. The gardens of Château Vaudreuil, which had served as the official residence in Montreal of the Governors General of New France from 1723, fronted Notre-Dame. The street's extension in 1821 led to the demolition of Montreal's Citadel. The Bingham house, which became Donegana's Hotel, was also located on Notre-Dame. In the early 1900s, it was the site of the former Dominion Park. 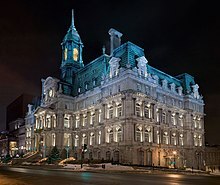 In Old Montreal, it is the site of such key structures as Montreal City Hall, Palais de Justice de Montréal, the Quebec Court of Appeal, the Château Ramezay, Notre-Dame Basilica and the Saint-Sulpice Seminary and the Sir George-Étienne Cartier National Historic Site. Further west, the street is home to the École de technologie supérieure and runs through Montreal's Little Burgundy neighbourhood, historically the home to the English-speaking black community. Joe Beef Restaurant is located on Notre-Dame Street in Little Burgundy. The funeral of Lt.-General Sir Benjamin d'Urban passed down Rue Notre Dame in 1849 and was captured in a painting by James Duncan. The funeral was instrumental in allaying bitter feelings and in preventing clashes between troops and the populace following the Burning of the Parliament Buildings in Montreal on April 25, 1849. In her book British Regulars in Montreal, Elinor Senior describes the cortege as follows: "All shops were closed from half-past ten in the morning until one o'clock. Sir James Edward Alexander estimated that 10,000 lined the street as minute guns sounded from Saint Helen's Island to mark the movement of the cortege to the military burying ground on Victoria Road (now Rue Papineau)". The spire of Christ Church can be seen on the left, together with one of the towers of Notre-Dame Basilica in the background. The building with the cupola and pennant at half-mast, in the middleground on the right, is Donegana's Hotel, which was situated at the corner of Notre-Dame and Bonsecours streets. It was destroyed by fire only a few months after the procession, on August 16, 1849. There are plans to turn the eastern portion of Notre-Dame into an expressway. Notre-Dame Street continues off of the Island of Montreal, heading northeast towards Quebec City, and is known as the Chemin du Roy (Route 138). ^ GRAHAM, Conrad. Mont-Royal - Ville Marie : Early Plans and Views of Montreal, McCord Museum of Canadian History, p.131. ^ DeWolf, Chistopher (2008-04-12). "Notre Dame opponents will protest tomorrow". Spacing Montreal. Retrieved 2008-04-12. This page was last edited on 15 August 2017, at 01:56 (UTC).